The earliest known cave paintings/drawings of animals are at least 35,000 years old and are found in Pettakere cave on the island of Sulawesi in Indonesia, according to datings announced in 2014. Previously it was believed that the earliest paintings were in Europe. 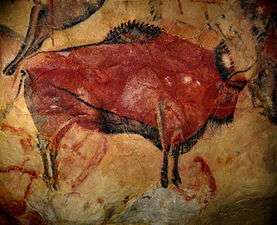 The earliest figurative paintings in Europe date back to the Aurignacian period, approximately 30,000 to 32,000 years ago, and are found in the Chauvet Cave in France, and in the Coliboaia Cave in Romania. The earliest non-figurative rock art dates back to approximately 40,000 years ago, the date given both to a disk in the El Castillo cave in Cantabria, Spain and a hand stencil in Sulawesi. 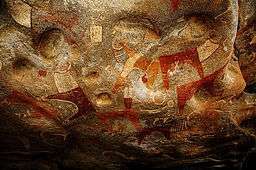 There are similar later paintings in Africa, Australia and South America, continuing until recent times in some places, though there is a worldwide tendency for open air rock art to succeed paintings deep in caves. The oldest date given to an animal cave painting is now a pig that has a minimum age of 35,400 years old at Pettakere cave in Sulawesi, an Indonesian island. 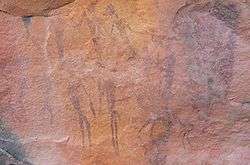 Indonesian and Australian scientists have dated other non-figurative paintings on the walls to be approximately 40,000 years old. The method they used to confirm this was dating the age of the stalactites that formed over the top of the paintings. This is effectively the same dating (actually 1,000 years younger) of a "red disk" from the Cave of El Castillo in Cantabria, Northern Spain, where there are "minimum ages of 40.8 thousand years for a red disk, 37.3 thousand years for a hand stencil, and 35.6 thousand years for a claviform-like symbol". 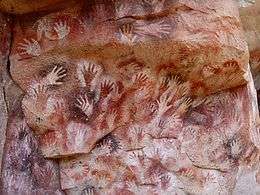 The art is similar in style and method to that of the Indonesian caves as there were also hand stencils and disks made by blowing paint onto the walls. Cave paintings in El Castillo cave were found to date back to at least 37,300 years old by researchers at Bristol University, making them the oldest known cave art in Europe, 5–10,000 years older than previous examples from France. This date coincides with the earliest known evidence for Homo sapiens in Europe. Because of the cave art's age, some scientists have conjectured that the paintings may have been made by Neanderthals. R. Dale Guthrie, who has studied both highly artistic and publicized paintings and a variety of lower quality art and figurines, identifies a wide range of skill and ages among the artists. He hypothesizes that the main themes in the paintings and other artifacts (powerful beasts, risky hunting scenes and the representation of women in the Venus figurines) are the work of adolescent males, who constituted a large part of the human population at the time. However, in analyzing hand prints and stencils in French and Spanish caves, Dean Snow of Pennsylvania State University has proposed that a proportion of them, including those around the spotted horses in Pech Merle, were of female hands. ↑ Ghosh, Pallab. "Cave paintings change ideas about the origin of art". BBC News. BBC News. Retrieved 8 October 2014. 1 2 Zorich, Zach (January–February 2012). "From the Trenches – Drawing Paleolithic Romania". Archaeology. 65 (1). Retrieved 7 March 2013. ↑ Welsh, Liz; Welsh, Peter (2000). Rock-art of the Southwest: a Visitor's Companion (1st ed.). Berkeley, Calif.: Wilderness Press. p. 62. ISBN 0899972586. 1 2 Valladas, Helene (1 September 2003). "Direct radiocarbon dating of prehistoric cave paintings by accelerator mass spectrometry". Measurement Science and Technology. 14 (9): 1487–1492. doi:10.1088/0957-0233/14/9/301. Retrieved 30 December 2012. ↑ Ghosh, Pallab. "Cave paintings change ideas about the origin of art". BBC News. BBC News. "The minimum age for (the outline of the hand) is 39,900 years old, which makes it the oldest hand stencil in the world," said Dr Aubert. "Next to it is , and this is one of the oldest figurative depictions in the world, if not the oldest one," he told BBC News. There are also paintings in the caves that are around 27,000 years old, which means that the inhabitants were painting for at least 13,000 years." ↑ Pike, A. W. G.; Hoffmann, D. L.; García-Diaz, M.; Pettitt, P. B.; Alcolea, J.; De Balbín, R.; González-Sainz, C.; de las Heras, C.; Lasheras, J. A.; Montes, R.; Zilhão, J. (15 June 2012). "U-Series Dating of Paleolithic Art in 11 Caves in Spain". Science. 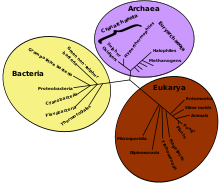 336 (6087): 1409–1413. doi:10.1126/science.1219957. Abstract: "... minimum ages of 40.8 thousand years for a red disk, 37.3 thousand years for a hand stencil, and 35.6 thousand years for a claviform-like symbol". ↑ Than, Ker (June 14, 2012). "World's Oldest Cave Art Found—Made By Neanderthals?". National Geographic Society. Retrieved 30 December 2012. ↑ Clottes, Jean (October 2002). "Chauvet Cave (ca. 30,000 B.C.)". Heilbrunn Timeline of Art History. New York: The Metropolitan Museum of Art. Retrieved 11 May 2013. ↑ Pettitt, Paul (1 November 2008). "Art and the Middle-to-Upper Paleolithic transition in Europe: Comments on the archaeological arguments for an early Upper Paleolithic antiquity of the Grotte Chauvet art". Journal of Human Evolution. 55 (5): 908–917. doi:10.1016/j.jhevol.2008.04.003. ↑ Zorich, Zach (March–April 2011). "A Chauvet Primer". Archaeology. 64 (2): 39. ↑ Ghemis, Calin; Clottes, J.; Gely, B.; Prudhomme, F. (2011). 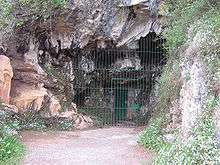 "An Exceptional Archaeological Discovery – the "Art Gallery" in Coliboaia Cave". Acta Archaeologica Carpathia. XLVI. ISSN 0001-5229. Retrieved 7 March 2013. 1 2 Masters, Emma (May 31, 2010). "Megafauna cave painting could be 40,000 years old". Australian Broadcasting Commission (ABC). Retrieved 30 December 2012. ↑ McGuirk, Rod (June 18, 2012). "Australian rock art among the world's oldest". Christian Science Monitor. AP. Retrieved 30 December 2012. ↑ Gray, Richard (5 October 2008). "Prehistoric cave paintings took up to 20,000 years to complete". The Telegraph. Retrieved 30 December 2012. ↑ Schiller, Ronald (1972). Reader's Digest: Marvels and Mysteries of The World Around Us. The Reader's Digest Association. pp. 51–55. LCCN 72077610. ↑ Whitley, David S. (2009). Cave Paintings and the Human Spirit: The Origin of Creativity and Belief. Prometheus. p. 35. ISBN 978-1-59102-636-5. ↑ Guthrie, R. Dale (2005). "Preface: Reassembling the Bones". The Nature of Paleolithic Art. Chicago [u.a. ]: Univ. of Chicago Press. ISBN 978-0-226-31126-5. Retrieved 31 December 2012. ↑ Hammond, Norman (September 11, 2009). 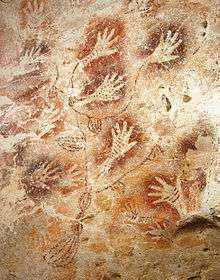 "Cave painters' giveaway handprints at Pech-Merle". The Times. Retrieved 31 December 2012. ↑ Jaroff, Leon (1997-06-02). "Etched in Stone". Time. Retrieved 2008-10-07. Wildlife and humans tend to get equal billing in African rock art. (In the caves of western Europe, by contrast, pictures of animals cover the walls and human figures are rare.) In southern Africa, home to the San, or Bushmen, many of the rock scenes depicting people interpret the rituals and hallucinations of the shamans who still dominate the San culture today. Among the most evocative images are those believed to represent shamans deep in trance: a reclining, antelope-headed man surrounded by imaginary beasts, for example, or an insect-like humanoid covered with wild decorations. ↑ "Apollo 11 (ca. 25,500–23,500 B.C.) and Wonderwerk (ca. 8000 B.C.) Cave Stones". Heilbrunn Timeline of Art History. New York: The Metropolitan Museum of Art. October 2000. Retrieved 11 May 2013. ↑ Bakano, Otto (April 24, 2011). "Grotto galleries show early Somali life". AFP. Retrieved 11 May 2013. ↑ Mire, Sada (2008). "The Discovery of Dhambalin Rock Art Site, Somaliland". African Archaeological Review. 25: 153–168. doi:10.1007/s10437-008-9032-2. Retrieved 22 June 2013. ↑ Alberge, Dalya (17 September 2010). "UK archaeologist finds cave paintings at 100 new African sites". The Guardian. Retrieved 25 June 2013. ↑ Istituto universitario orientale (Naples, Italy) (1992). Annali: Supplemento, Issues 70-73. Istituto orientale di Napoli. p. 57. ↑ "Rock Art Sites of Somaliland". CyArk. Retrieved 28 March 2014. ↑ Universität Frankfurt am Main (2003). Journal of African Archaeology, Volumes 1-2. Africa Manga Verlag. p. 230. Retrieved 7 September 2014. ↑ "Tassili n'Ajjer". UNESCO World Heritage Center. Retrieved 31 December 2012. ↑ Tugman, Lindsey (1 September 2011). "Oldest cave drawings found in Romanian cave". CBS News. Retrieved 11 May 2013. ↑ "Rock Shelters of Bhimbetka". World Heritage Site. Retrieved 2009-12-22. ↑ "Baja California Rock Art Dated to 7,500 Years Ago". news.nationalgeographic.com. Retrieved 2016-03-29. ↑ Simekm Jan F.; Alan Cressler; Nicholas P. Herrmann; Sarah C. Sherwood (2013). "Sacred landscapes of the south-eastern USA: prehistoric rock and cave art in Tennessee". Antiquity. 87 (336): 430–446. ↑ Weber, George. "The Semang". The Negrito of Malaysia. Retrieved 11 May 2013. ↑ Chazine, J-M. (2005). "Rock Art, Burials, and Habitations: Caves in East Kalimantan" (PDF). Asian Perspectives. 44 (1): 219–230. doi:10.1353/asi.2005.0006. Retrieved 12 May 2013. ↑ Fage, Luc-Henri (August 2005). "Hands Across Time: Exploring the Rock Art of Borneo". National Geographic. 208 (2): 44–45. Retrieved 7 October 2013. ↑ Australian Geographic (October 2014). "Indonesian cave art sets new record".